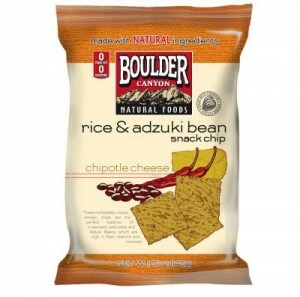 I like the spicy flavor Boulder Canyon’s Rice & Adzuki Bean Chipotle Cheese Chips and the fact that they’re made with nutritious adzuki beans. Those adzuki beans are naturally rich in fiber, magnesium, potassium, iron, zinc copper, manganese and vitamin B3. My sister introduced me to these chips while at work last week. They are the perfect combination of spice, salt and crunch. She buys them at Costco and so can you! I had not been to an Applebee's in a really long time because well, I feel like anywhere is usually better than Applebee's. In this case, it was the only place open so, the choice of where to go was made by default. 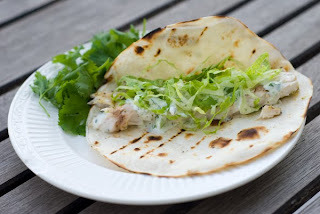 These are a new option on the Sharable Starter Menu - the Chicken Wonton Tacos. All white meat chicken stuffed in crispy wonton shells and topped with crunchy Asian slaw with cilantro. 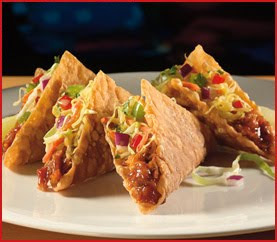 These are definitely worth ordering if you find yourself in an Applebee's. Give the Pulled Pork option a try, they sounded pretty great too. We have NCHA shows in Rancho Murieta two times a year. One in the Spring and the other in the Fall. We always make it to the El Gallo, which is the Mexican Restaurant, and the StoneHouse Bistro to get some relief from being in the sun all day long. Bobbie took the reins and ordered a bottle of Byron'o8 Pinot Noir from the Santa Maria Valley. It was terrific, she sure knows her wine! I ordered an old faithful, the StoneHouse Crab Cakes - house made blue crab cakes panko breaded and fried, corn nage and roasted pepper coulis. I have ordered these here every time I have visited the StoneHouse. They are pretty much perfect. 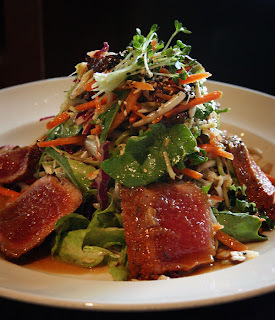 Bobbie and Scott both ordered the Special of the evening, Seared Onion Crusted Ahi caramelized onion, micro green salad, apple cider vinaigrette, crispy fingerling potatoes. They both just thought it was fantastic. 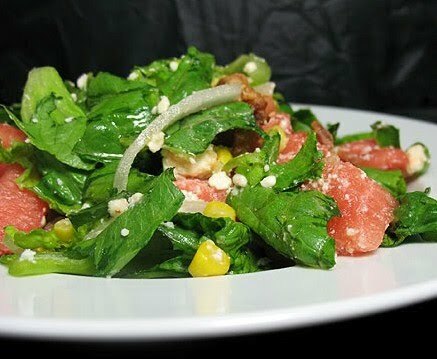 A healthy portion and just a wonderful combination of flavors. 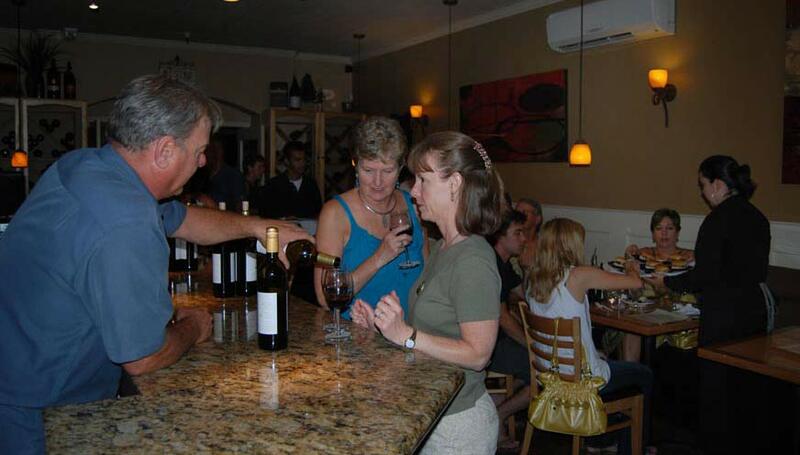 The time we spend in Rancho Murieta is typically a good one. Last year during the Fall show we brought bikes and took leisurely rides throughout the community. The restaurants are always so full of life and the locals, as well as horse show visitors, are so friendly. 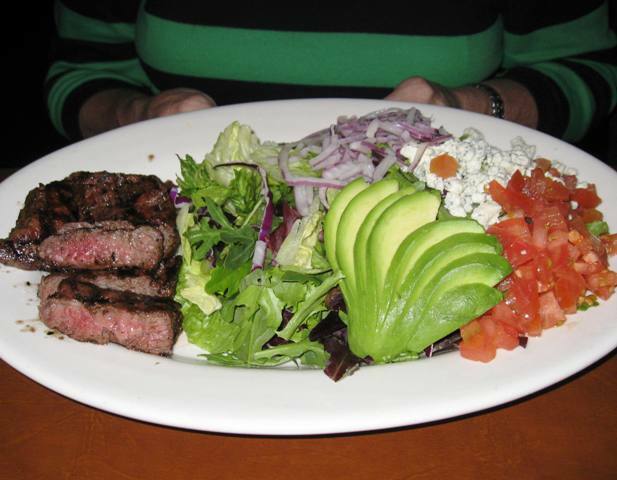 A for sure, solid meal can always be found at StoneHouse Bistro. Go for a quick bite and a glass of wine, at the the very least! What I find probably the best thing about Cool Hand Luke's is that they serve their warm bread with a crock of ranch beans. It sets them a part, makes them different. 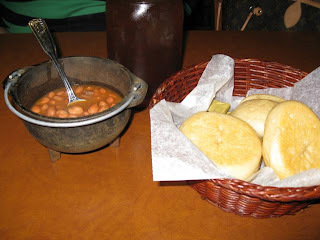 The beans were mostly used for soaking the bread - more like a dipping sauce. My mom ordered the Cobb Salad. The meat was cooked to perfection and it really was a piece of art, very easy on the eyes. Don't you love how they fanned the avocado! Ha, I do! I went for the Calamari Steak with Garlic Mashed. It was a large steak, too large - I ate half. What a waste. The mashed potatoes were fine, nothing to really write home about though. Everything was just fine. Typical chain restaurant. Nothing terrible, yet nothing out of this world. Our server was pleasant and we actually got seated very quickly considering how many people that were waiting in the lobby. I have been to several Cool Hand Luke locations and this one seems to be doing very well! I am a huge Paul Newman fan, what a looker -So this restaurant will always have a special place in my heart. 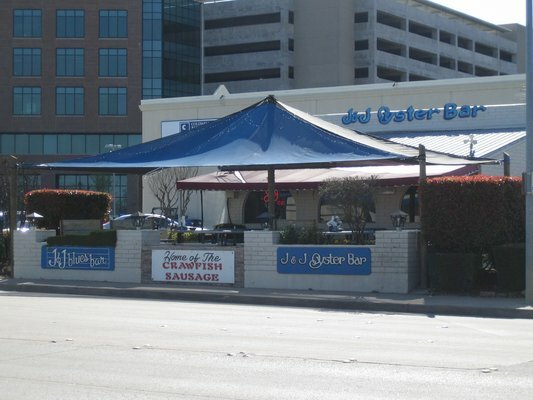 During a free set of the NCHA Super Stakes we found some time to go on down University Avenue to go to J & J Oyster Bar, also known as J & J Blues Bar... I had no idea that this place turns into a rockin' party after the sun goes down! There is pretty much everything seafood on the menu but Lauren and I both went for soup. 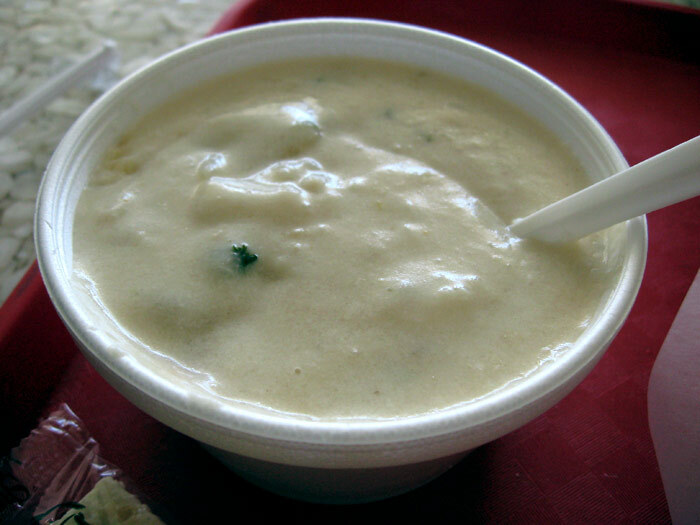 Originally we both ordered the Clam Chowder but we were informed there was just enough for one more bowl, so I graciously encouraged Lauren to have it. 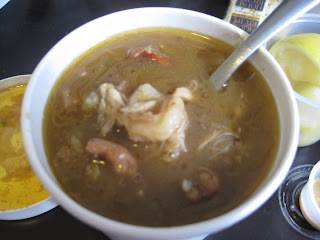 I ordered the Gumbo instead and think I actually came out on top! It was delicious! Lauren was not too impressed with her chowder. 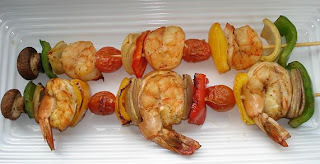 Scott encouraged us to order something other than soup - since we were at a major seafood destination in Fort Worth, so we split the Shrimp Kabobs. They were tasty. The grilled vegetables were a nice treat as well. Scott ordered the Fish Taco plate, there were 3. He seemed to enjoy them. No complaints were heard. He really likes Fish Tacos and orders them quite regularly, I am sure these were ranked pretty high on his Fish Taco Scale. It was a beautiful day in Fort Worth so we enjoyed sitting outside, soaking up some sunshine. Thank goodness for the Saltines that were sitting on the tables, we were starving and it seemed to take a little while to get our food. Our server was pretty busy, we didn't see her too often - it was a busy day at J & J's! I would definitely go back, I didn't even get to try the Crab Cakes - what was I thinking?! 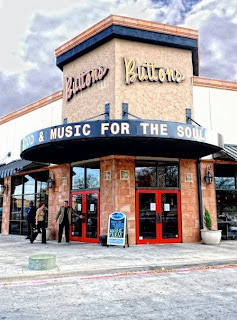 Food and Music for the Soul is the motto for Buttons Restaurant located just off of the I-30, Hulen Exit. 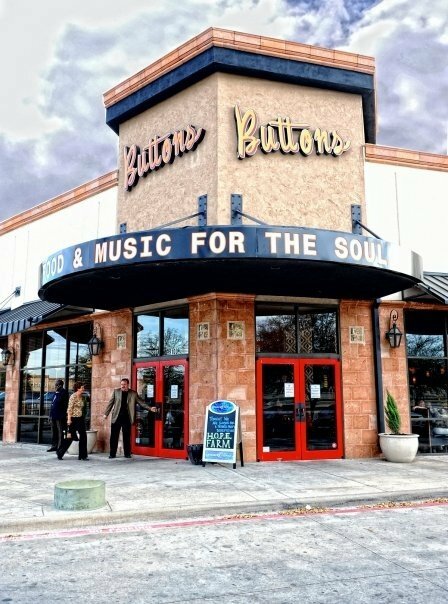 I guess it is a relatively new restaurant but is making a splash in the FW scene with it's live music and soul-soothing dishes. We even found a great Draft beer selection - Fireman's 4. What a treat, very tasty. 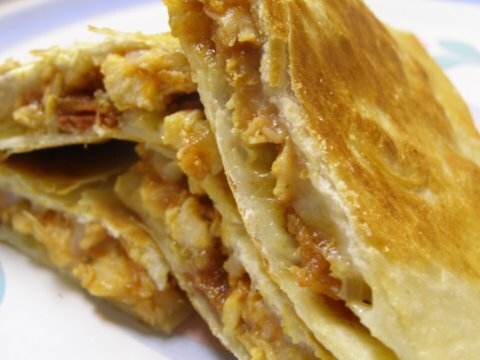 Chipotle Chicken Quesadillas - grilled chicken, caramelized onions and blistered Santé Fe peppers. We got this as an appetizer during Happy Hour on one of our many visits, I told you we loved the place! I am not sure that the appetizer knocked our socks off, but it certainly did the trick. cheese crumbles and candied pecans, tossed in Pomegranate vinaigrette. Lauren ate a lot of salad this trip, I need to take a clue. She bragged on this salad all night. She loved the watermelon and pecans... She was a happy camper, oh and she ordered a Lemon Drop too. That may have been why she was in an extra fantastic mood! 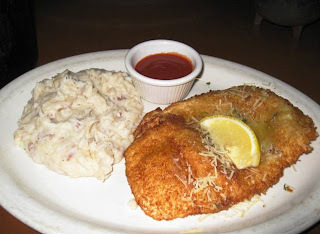 Best dish I ate in Texas, by far. This what they call the Phat Snaps -Lightly blackened, pan seared filet of snapper with a crab and shrimp stuffing. 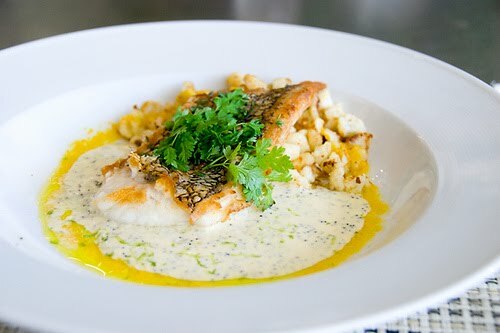 Served on a bed of corn chowder with lemon butter drizzle. So delicious. I split this with Scott because I never finish an entree and he wasn't that hungry and it was the perfect amount of food. They were nice enough to split the dishes in the kitchen for us. The waitress was kind of funny, she said it was one of the healthier dishes on the menu - it was swimming in butter, delicious, but really? I loved it, Scott agreed. Lauren browsed the Dessert menu and came up with a good find - Blueberry, Banana & Walnut Bread Pudding with blueberry drizzle. Hello lover! Great order, mostly Lauren and I indulged. Okay, this place was a great little find. 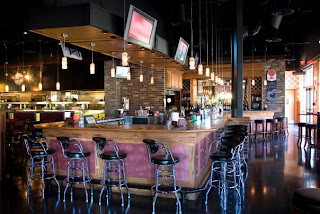 It is easy to get to, located in a great shopping plaza and it is just a lot of fun. 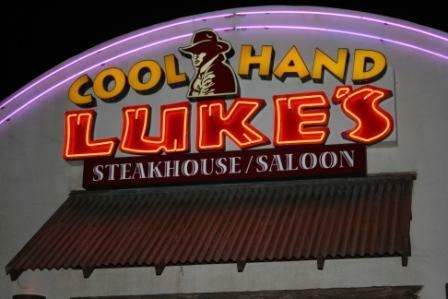 The food is definitely soul food and I haven't had much experience with that. Happy Hour is 4pm - 7pm and all app's are half off, score! Go get a Fireman's 4, it is totally refreshing. Music is usually rockin' in the bar area, so get your groove on and get down there! I can't wait to go back!